I found these old photo-albums and an ink plotter a while ago. These were all from the twenties and thirties I think. Not in the best condition but still beautiful! So strange to imagine that these albums once belonged to someone, were part of someone's history. And the journey they must have made to end up in my studio. I bought them initially to do something crafty, but I still couldn't bring myself to use them yet. For now I just look at them occasionally and wonder about the people on the photographs, who they were and what they were doing. One album is from Hungary, from a family called Winkler Karoly. Which Google tells me is quite a common name in Budapest. The other is from an English family spending some time abroad, somewhere in Europe. So wonderful to get a glimpse of an era I've never been part of. I've found these glass slides from the sixties a while ago at a thriftshop. All pictures were taken in Italy. Love how you get a sense of that era while looking at those slides. We'll be spending our holidays in Italy aswell this summer, so looking forward to our holidays! I received this summertime mail from Mirjam. She crocheted a summer bag and she had put the bags and envelope inside the bag. A cool idea! So if you are looking for me, I'm at the pool, swimming! Since Ania was getting married, I've made a paper flower wreath as a wedding present. That always seems very romantic to me, a flower wreath. Ania had written she was going to wear a flower wreath in her hair at her wedding, that's so romantic! I wanted to try if I could make a wreath out of tissue paper. Well, I could and it turned out to be really lovely! It fitted perfectly in a mailbox size box. I've made a drawing aswell wishing it could rain down love. Well, if it was raining down love, I would be the first to dance in the rain. But I guess most people would want to do that. 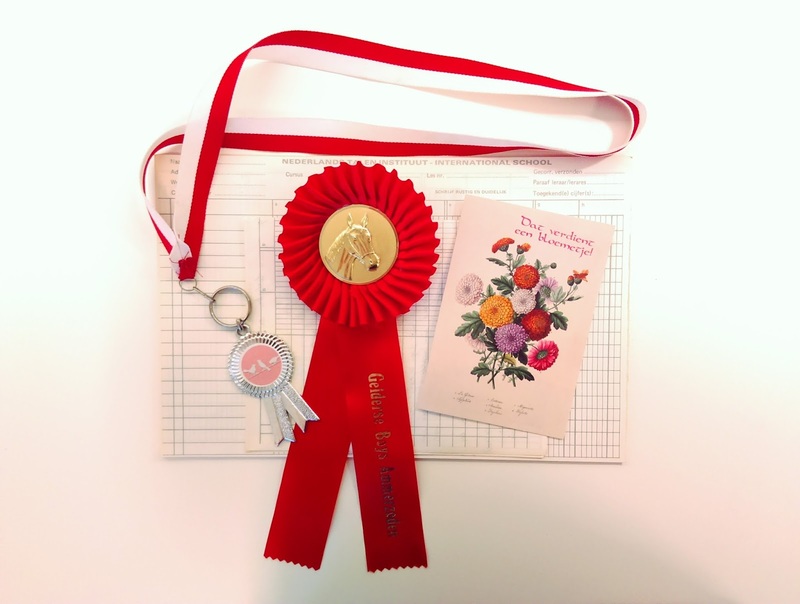 As a thank you for sending her a vintage magazine with a picture of a reading woman, Margit sent me this lovely package. She put it all in a mailbox size box which she decorated with pages from an old biology book. She sent me these vintage cardboard bobbins, I love and collect those. She also sent me some postcards, a schoolbook and some stamps. There was also a teabag included, but I drank that one straight away :-) because it smelled so lovely of cinnamon. On instagram Catherine who is a really busy mom of eight (yes, eight!!!) (let's give her some huge respect for that!!! ), had done a huge stationary haul. She wanted to send some to me, even though I live overseas and shipping costs are quite high. How sweet is that! And look at the amazing stationary she sent me! If you are looking for me, I'm in stationary heaven right now. 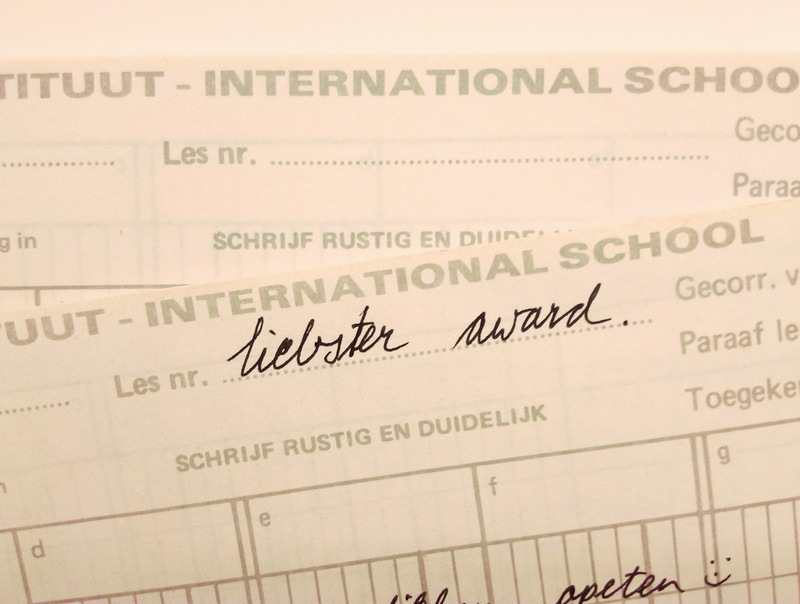 I was nominated for the Liebster award by Carin from Moose travelling. Ehmm, that was way back in february. Anyway, I think it's ever so sweet from Carin to nominate me. But it's an award that when you accept it, you are supposed to nominate ten others bloggers. And that's just not me, I'm akward like that. Don't get me wrong, I do read lots of other blogs. But I feel quite okay just doing my blog thing, and doing it my way. So an award you can only receive by nominating other blogs, is not really an award is it? But since it sort of feels special that Carin thought of me and she was nominated herself, I've sent her a price. What's an award without a price! And a great excuse to use my vintage ledgers to write a letter on! Inspiration: a paper flower tutorial. Believe it or not, but here is my first ever tutorial! How to make a paper flower out of tissue paper. Yes even you can do it! Give it a try! This is what I have sent to Jay in return for our paper swap. Some vintage envelopes full of vintage paper ephemera, postcards and some old photos of trams. I found a page of old canadian stamps that I included in an envelope and a collection of my drawings. Hope it gets a good purpose in Canada. When summer arrives, also do the local fleamarkets. They are always somewhere on a small square in a small village, and benefits always go to the restoration fund of the local church. Amongst a lot of terrible and broken stuff, there are always some treasures to be found. Like these seventies plastic pots, or the porcelain dolls arms, doilies or cigarbands. Great stuff for small prizes! A while ago I received this beautiful vintage package from Alice. This is what I have sent her for my part of our vintage swap. I wrapped everything in small paper bags. I was waiting for the perfect opportunity to use some of my collection of sanitary towel bags. 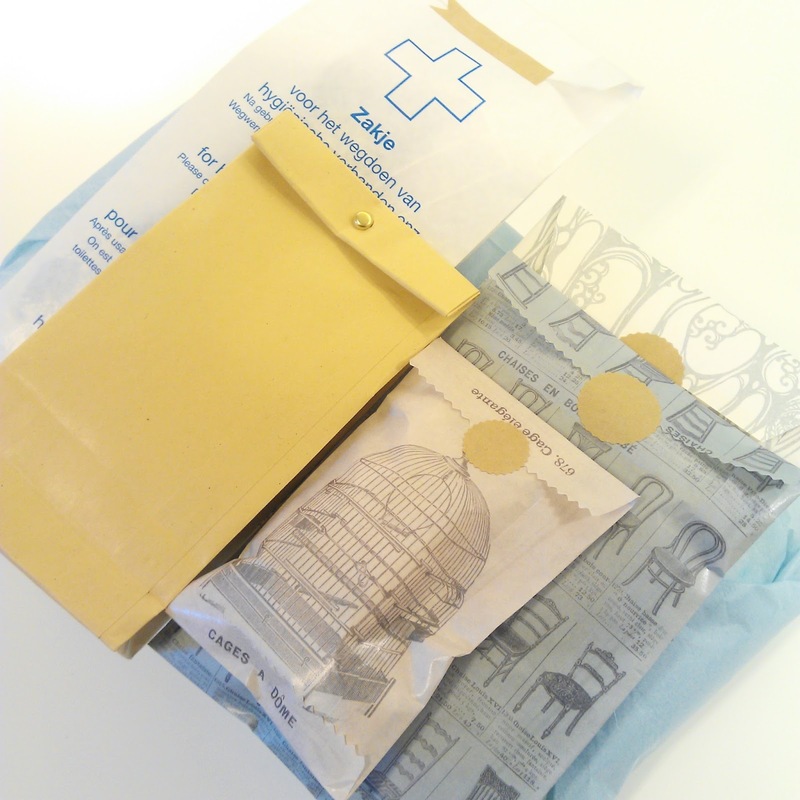 I love these bags, everytime I'm visiting a toilet I have a look at the sanitary towel bags. Call me crazy, and maybe I am a bit, me sitting on a toilet and admiring the sanitary towel bags, but these bags are made of a sort of sturdy vellum you can only find in a sanitary towel bag. Ehh, well, I'm drifting off the subject now. 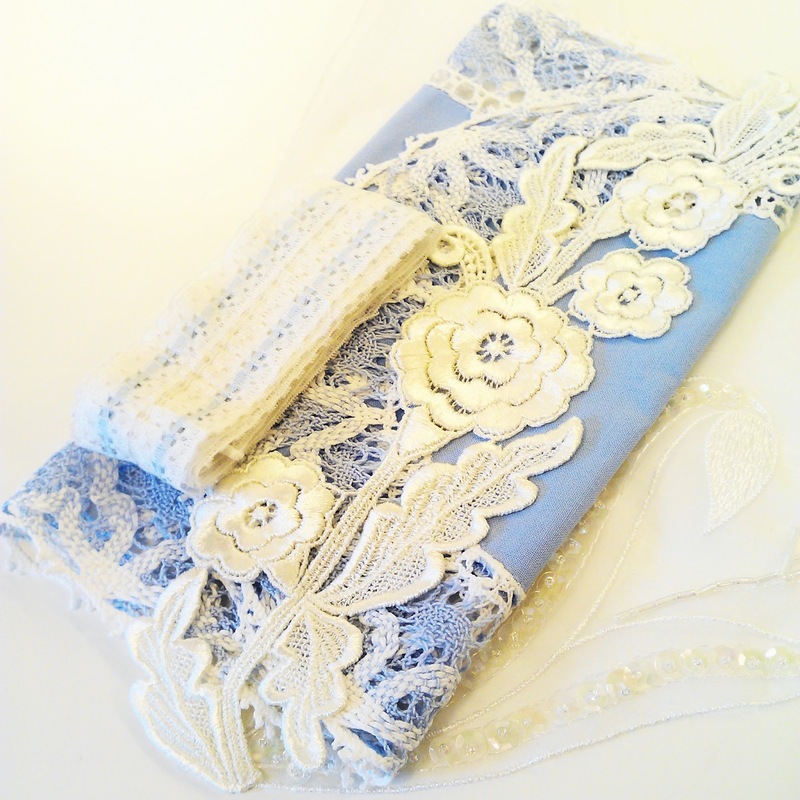 I've made a collection of lace and ribbon with a blue feel to it. I've parted with part of my collection of cardboard bobbins (and that was a hard thing to do). The brassiere used to belong to my grandma, that's a true story! She gave it to me maybe about twenty years ago or something, I think it's from the sixties or seventies and still in perfect condition. It's just not my size though unfortunately. And it matches great with the sixties of seventies dressing gown I found on a thrifting hunt! My other grandma was definitely a grandma that was wearing that kind of synthetic stuff. Also included some vintage stationary and postcards (not on picture). I love vintage stationary, just can't get enough of that! I also included a set of porcelain dolls arms. And the first time I could use my waxseal! I'm really glad Alice liked it all, since I got a bit insecure with all her cool vintage stuff she finds at fleamarkets. My name is Franka, but my daughter sometimes calls me Mme Nosenose, and I have no idea why really. My nose is quite average, nothing special. I do have a nose for postal creativity though. I love mail. Connecting the old fashioned way. I have a thing for beautiful paper, prints, ephemera, vintage pictures, stamps, papercraft and all that's creative. Mme Nosenose. Picture Window theme. Powered by Blogger.